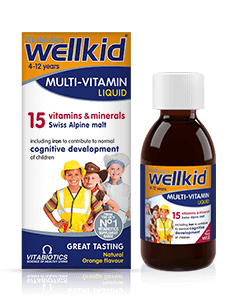 Great tasting multivitamin - in delicious natural Orange or Strawberry flavours. 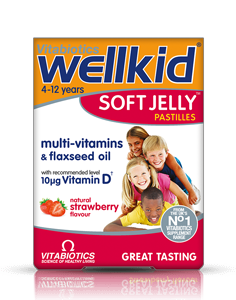 Wellkid Soft Jelly pastilles provide a multivitamin formula to help safeguard the nutritional intake of children aged 4-12 and are available in two great tasting flavours: Strawberry and Orange. 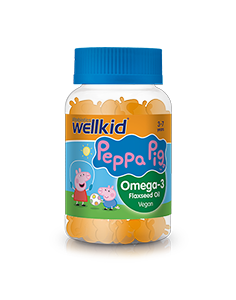 No other supplement for children provides 11 vitamins plus flaxseed oil. 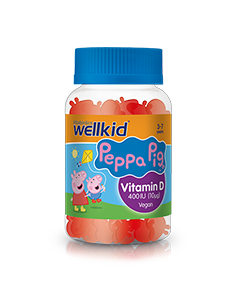 Wellkid Soft Jelly includes all eight B-complex vitamins plus vitamin C, D and E. Two pastilles provide 10µg vitamin D as recommended by the UK Department of Health. Vitamin D is needed for the normal growth and development of bone in children. 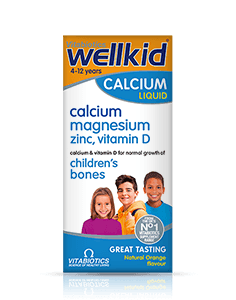 For parents particularly concerned about the normal bone health of their children we recommend Wellkid Calcium Liquid, which can be taken alongside Wellkid Soft Jelly, which contains calcium and vitamin D, which are needed for the normal growth and development of bone in children. Growth is especially rapid during the first 12 years of a child's life and children have a high nutrient requirement relative to their body size. Meeting those nutritional requirements can be a challenge, as it is common for children to be fussy eaters. You may experience your child refusing to eat certain foods, disliking certain tastes or textures, or being reluctant to try new foods. 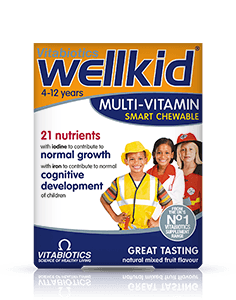 Children usually grow out of fussy eating and in the meantime nutritional supplements such as Wellkid Soft Jelly pastilles can help safeguard a child's nutritional intake as part of a balanced diet. The formula is based in the very latest scientific research. 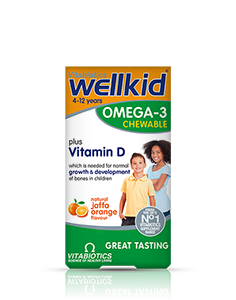 With nutrient levels carefully optimised to the specific needs of growing children. 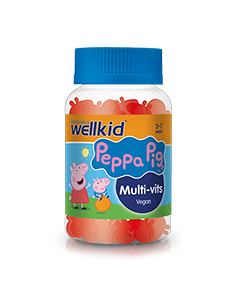 Available in delicious Strawberry and Orange jelly flavours popular with children. 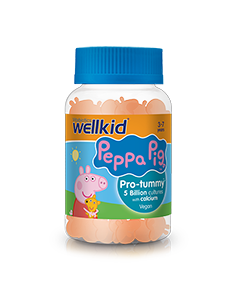 Wellkid Soft Jelly is produced to high GMP (Good Manufacturing Practice) standards of quality control. 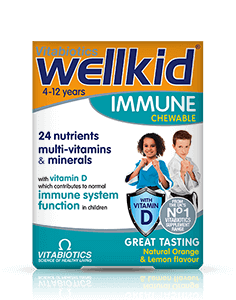 Wellkid Soft Jelly does not contain any synthetic artificial colours, preservatives, lactose or yeast. 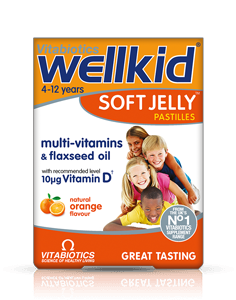 Wellkid Soft Jelly has not been tested on animals. Always read the product directions before use. Do not exceed the recommended intake. Excessive consumption may produce laxative effects. As with other supplements, seek professional advice before giving to your child if they are under medical supervision or suffer from food allergies. Vitamin supplements are not intended to treat or prevent any disease. Food supplements must not replace a balanced and varied diet, and a healthy lifestyle.